Back on February 10th, Steve Silk announced that the Gardening Gone Wild Plant Pick of the Month was nicotianas (flowering tobaccos). In the spirit of waiting until nearly the last minute to take part, I’m finally getting around to thinking about some of my favorites. 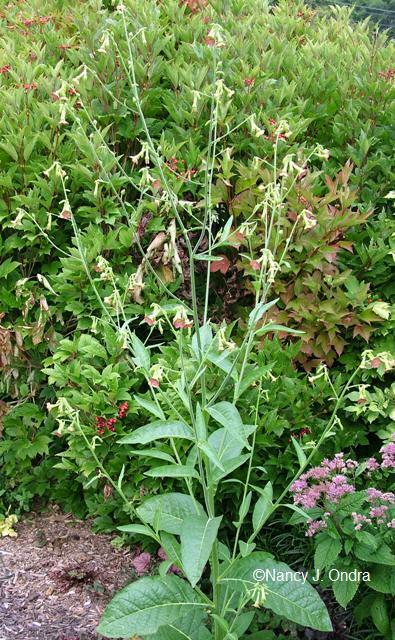 I have to admit that I’m envious of Steve’s ability to grow woodland tobacco (Nicotiana sylvestris). Judging by his photos of it in others’ gardens, as well as the comments from Adam, Fran, and other bloggers, he’s not alone. It’s one of those plants that just doesn’t want to do well for me: it either sulks and dies, or it gets aphids, sulks, and then dies. Elizabeth’s comment there about it being a “bug magnet, and not in a good way” makes me feel a little better; at least it’s not just me. I’m going to try direct-sowing it this year, following Steve’s tips, and maybe the plants will be big enough to tolerate the aphids and still reach blooming size. 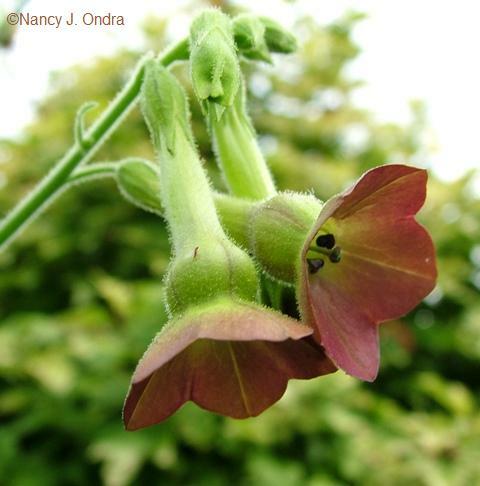 One nicotiana I do have luck with is a green-flowered form that showed up in my old garden years ago. 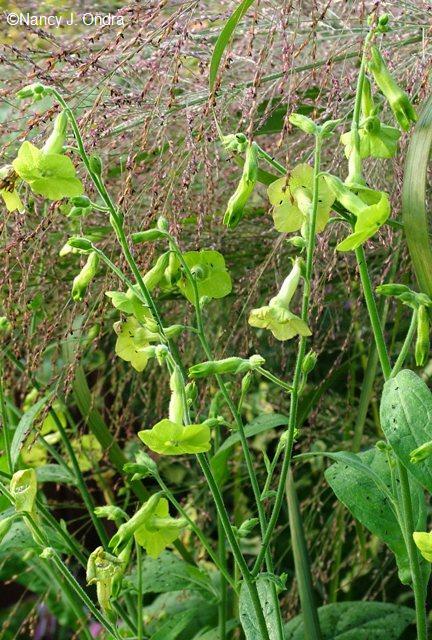 I was in a wow-aren’t-green-flowers-cool phase and planted both ‘Lime Green’ and N. langsdorffii near each other. The following year’s volunteers had the intense green color of the latter but the larger flower size of the former, with bloom shapes somewhere between the two. I thought they were neat and donated the seed to the HPS/MAG Seed Exchange program that year as “Green Mix”, for want of a better name. Then the next year, someone donated it back as ‘Ondra’s Green Mix’, and it seems to be keeping that name from year to year. When I moved to this place, I lost my stock, but fortunately I was able to get the strain back through the exchange. I don’t bother starting the plants indoors, because they self-sow readily and make much better combinations than I could ever come with on purpose. They usually reach 24 to 30 inches, sometimes 3 feet. A few years ago, I picked up a six-pack of ‘Tinkerbell’ seedlings to use as fillers. Tink’s blooms were rosy pink to brownish pink inside and mostly green on the outside, and the plants were rather taller – in the range of 3 to 4 feet. The following season, a volunteer that appeared on the opposite side of the path topped out at nearly 7 feet. Other seedlings in that part of the garden looked more like my original strain size-wise, but instead of the consistent green color, some of the seedlings had green blooms and some had brown ones (shown close up in the photo at the top of this post). I ended up donating that seed last fall as “Mint Chocolate Mix”. Fortunately, volunteers in more-distant beds stayed consistently green, so I’m hoping I still have the original strain as well. Another tobacco I’ve enjoyed for a few years now is N. mutabilis. I originally acquired it as ‘Marshmallow’, but I think that’s one of those made-up cutesy names and not any distinct strain. The plants consistently reach about 4 feet for me, with an open branching habit and white flowers that quickly turn light pink, and then rich pink if the weather isn’t too hot. I’m not a big fan of pink, but the whole effect is pretty charming. It’s a dependable self-sower, too, which is a plus. Come to think of it, I bet it would look awesome with the all-green strain. And I’d love to see what might happen if those two crossed. I can’t believe I’ve never tried to grow these. The pink one definitely charms me, but then any pink flower does. As windy as it is here though they probably wouldn’t stand upright for long. The *really* tall ones might have a problem, Robin. But the others are kind of airy, so they don’t seem to catch the wind much. And when several of the branching kinds grow in a patch, their tops weave together, and the plants hold each other up. It could be worth giving them a try. Hi Nan, so glad to see your Ondra’s green again, and all the wonderful tobaccos. Tinkerbell self sows here, in the gravel paths, not the beds and the ones at the edges live long and fruitful lives. Friend Tina from In The Garden gave me seeds of N. sylvestris. It is up but still small. Maybe keeping it under cover longer will let it get strong enough to fend off insect attack. I hope you, at least, have good luck with the woodland tobacco. I really think direct-sowing might be the answer for me. After writing about the ones I do have luck with, I realize that they all self-sow; it’s the kinds I transplant that I seem to have trouble getting established. A friend of mine always has these in his garden. I always say I’m going to grow them but they haven’t sprouted in my garden yet. After seeing these pictures I am once again thinking about them. It’s rather early to see the seedlings, isn’t it? You made me look anyway, but I haven’t spotted them yet. Hi Nan .. they are very pretty and almost (dare I say ?) dainty looking ! .. I have had a few in my time too .. my first were the (sorry name escapes me) white ones that sent a scent out in the evening which absolutely made me LOVE it : ) First impressions with a plant last a life time don’t they ? Absolutely, Joy! I really hope this is my year to get to enjoy that fragrance. We’re planning an “evening in the garden” event at work this summer, too, so I’m hoping to get the night-scented ones going there as well. I planted white Fragrant Cloud in 2004 (part shade) and have had 2 to 3 foot plants every year. They grow in the scented garden but since I rarly wander through the garden at night, I have never noticed any scent. 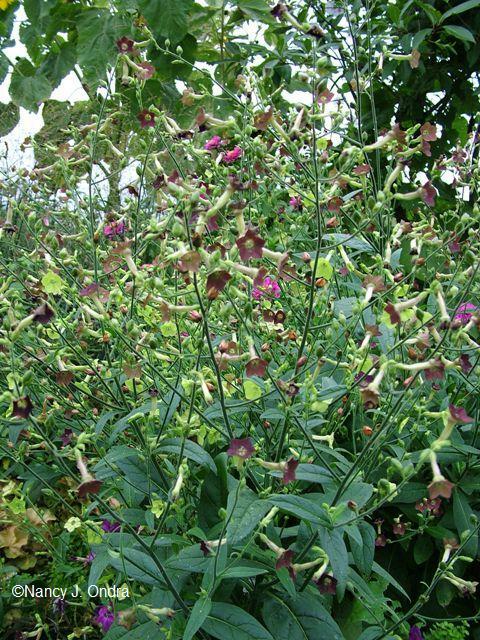 Do you notice any scent in the Nicotiana you mention? I’m pretty sure the green and brownish ones don’t have any scent, Marie. I don’t recall the N. mutabilis having any either, but I could be wrong; I’ll have to make sure I sniff it this year. Personally,I’m just relived that there are plants even you can’t grow! I haven’t played around a lot with annuals. Obviously I need to reconsider. 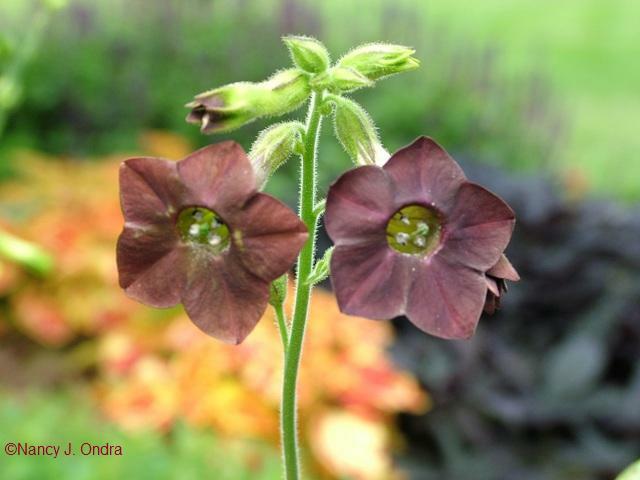 I love the Chocolate Mint Nicotiana. The few Nicotianas I’ve grown have been the standard, short bedding variety but I’d love to try the tall ones. I’ll put them on my list I guess. Oh, Cynthia – you’re joking, right? There’s lots of stuff I can’t grow. Couldn’t do Oriental poppies to save my life, for instance. And I’d really like to grow those big crested celosias: the ones that look like brains, you know? One of my earliest memories is having them in my little garden plot, and they were taller than me. I’ve been trying to grow them again for the last 20 years with no luck. Sigh. Yep, the tall woodland tobacco is supposed to have a great scent. I’ve started cleaning up part of the garden where I’d like them to grow, so I’m hoping to direct-sow some very soon. I’ll definitely be trying some this year. I seems to attract aphids by the millions so hopefully I can manage them. They sound like a good trap crop. Your green one’s look pretty cool! Hey, I hadn’t thought of that, Dave: nicotianas as a trap crop! How organic of you. Nan, even though they do get the bugs, I have been able to hose them off pretty successfully. It is only late in the season that it gets really bad. But I have no such difficulty with any of the other varieties, all of which I love. Have you tried the Red Bedders from Select Seed? Those are great. Thanks for the tip, Elizabeth. Mine usually get hit while they’re still in the rosette form, so I must be doing something wrong. Thanks too for the info on the ‘Red Bedders’; I’ll check them out. Wow, I didn’t know there were so many different kinds! I’m fairly new to Nicotianas. A couple of years ago I planted my first ones, “Perfume Lime”, but was very disappointed in the lack of perfume! They were pretty but short and lacked the fragrance I was expecting. Thankfully I tried a new kind last year. I never knew the variety but they were white and wonderfully fragrant and hardy. I have some seedlings from them plus bought some more from the same nursery. I hope they’re just as great this year! I do love those rosey-brown ones you have. Well, how disappointing for ‘Perfume Lime’ to have no scent! Talk about false advertising. Grrr. At least you’ve found a kind that you *can* enjoy. I’ll wish both of us good luck, Lynn. If you want to see some more great nicotianas, be sure to check out Steve’s original post over at Gardening Gone Wild. I didn’t hear the podcast, but I think the brownish ones can be developed into a seed strain without too much trouble. Sometimes, too, the langsdorffii types will overwinter outdoors here (mid-Zone 6). The ‘Tinker Bell’ and ‘Mint Chocolate Mix’ are stunning. I love the way they look. I love Nicotiana and have never had problems with bugs. I just wish I took better photos of them though ~ not an easy feat. You’ve done wonderfully here! Thanks for visiting, Kate! Steve’s photos are even better – don’t miss them. Nan, I’ve learned a lot about Nicotianas from both your post and Steve’s. I’ve had a medium height deep purple one self-sow, but I see there are so many lovely tall varieties and those white fragrant ones look wonderful in the pics on Steve’s post. I love your pink, and the dusty pink/brownish…and the green..well, all of them! Great info and pics. Thanks! Glad you enjoyed it, Kerri! A deep purple one sounds lovely. I’m so looking forward to trying the jasmine tobacco that Steve showed, and the woodland tobacco, too. Poor Susan! Well, one small comfort I can give you is that the orangey aphids that feed on milkweeds don’t bother many other plants, so you shouldn’t have to worry about those. I usually don’t have much of a problem with aphids on cosmos, but if I do, I just snip off and crush the infested tips. The problem with the nicotianas is that they’re so sticky, it’ll probably be hard to wash off the aphids. Why not just wait and see what happens? I have heard of using nasturtiums as a trap crop in veggie gardens (for real), so I guess you could try that next year if you really need to. Good luck! I just stumbled in to your blog. 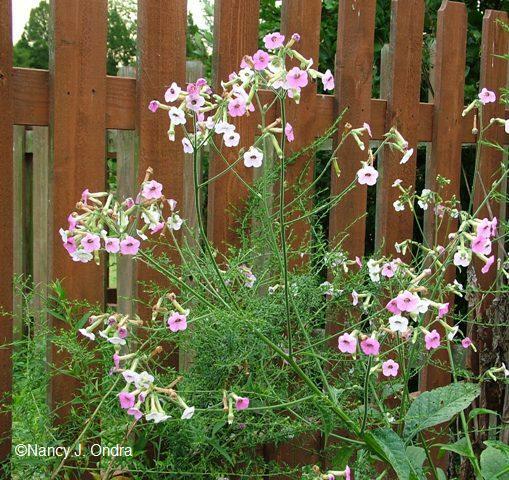 I too realized that I’ve never considered Nicotiana for my garden. I’m a sucker for showy flowers like the “Marshmallow” so I’ll be looking for it now! The GGW Pick of the month was also a nice bit of information. Thanks. Welcome, Patrick! Sounds like we’ll both be enjoying nicotianas this summer. I’m glad you enjoyed Gardening Gone Wild, too. I love Tinkerbell and Ondra’s Green. A pity they aren’t scented, but they are beautiful. You may be happy to know that my N. sylvestris died after a couple of years – and I was growing it in the woods. One you must have is N. alata, jasmine tobacco, its unfolding evening blooms breathe out scent, and my plant has lasted in a container for many years through moves and different sun conditions. This year I’m getting the heirloom ‘Cranberry Isle’; it looks as if it might be sort of like mutabilis, but scented, a high priority with me. About aphids: this may be heresy, but in my garden I often find that they come and they go without much help from me, and without a lot of damage, either. I appreciate the recommendations, Pomona. I had excellent luck germinating jasmine tobacco this spring and hope to enjoy the fragrance this summer. Good luck with your ‘Cranberry Isle’; it sounds lovely.